Which publishers won the Golden Globes? 2017 has begun and so has the awards season. While some big events are still ahead of us, we already have the Golden Globes covered. And while we know “La La Land“ is the winner of the awards, We are of course interested which publisher won the awards in the Google News boxes mobile and desktop. As always we have provided all keyword sets at the bottom of the text. For this event we have not one keyword set from the 7th until the 9th of January, but one set that we have developed over 3 days – matching the fresh daily information. That means that this set is split in three parts for easy readability. First we will present you the overall top 5 publishers for all days combined in the Google News Boxes for desktop and the mobile AMP Carousels. Afterwards we will look at the day of the event and the day after in the desktop News Boxes to show you the changing visibility in the news coverage. For AMP Carousels we will only focus on the main day. Dailymail.co.uk is surprisingly the overall strongest publisher for all days. First we look at the desktop News Boxes for all days. For most of the days dailymail.co.uk takes the cake. Even tough they are originally an European publisher, they have proven themselves to be strong in world news – especially in the Entertainment department. Their visibility has only suffered sunday afternoon, but still an overall stable job. 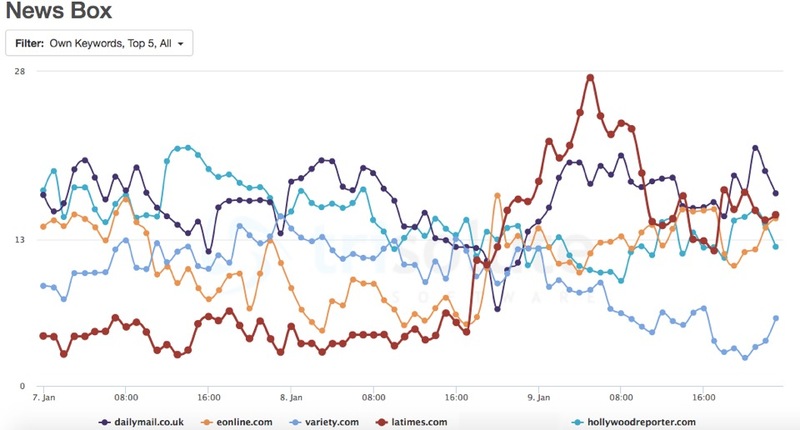 Hollywoodreporter.com is also a steady player, but their score has decreased a little over the three days, just as variety.com’s visibility has steadily decreased even more over this time period. Eonline.com started great on the first morning, but had a dip in their visibility until sunday afternoon. But after all they got back on track and finished strong on monday. The last competitor in the top 5 is latimes.com. Interestingly, they have jumped in their visibility on the 9th of January. They had their peak at 5 am on monday – their best keyword being “fences“ – 8 entries with 2 articles during 4 measurements in one hour – with articles surrounding the mix-up and Viola Davis’ speech. Big jump upwards for people.com from the evening of the 8th on. The mobile results in the Google search are getting more and more important. Therefore AMP Carousels have gained a lot of importance in 2016 and their percentage in the mobile SERPs is permanently increasing. So this is what we look at next. The overall good and steady competitors here are hollywoodreporter.com and variety.com. Also an overall nearly equally strong player is yahoo.com, but whereas they gain in visibility on the 9th, deadline.com loses a bit of their visibility. But the suprise is people.com. While they are “lost within the great competition” on the first two days, their visibility springs up throughout the late evening of the 8th and stays incredibly high on the 9th with their maximum visibility of 53.43 percent also at 5 am. Latimes.com goes from mediocre to incredibly good in the later hours of the 8th..
Now we take a more detailed look at the different days. Let us start in the Google News Boxes for desktop with the two strongest publishers of the top 10 on sunday morning 8th of January: dailymail.co.uk and hollywoodreporter.com. While they stay in the top quarter for the whole day, from noon onwards the competition closes up to them. In the upper range are also variety.com, justjared.com, theguardian.com, usmagazine.com and avclub.com. But more interesting are the performances of eonline.com, yahoo.com and latimes.com on that day. While they do not reach dailymail.co.uk’s visibility level, eonline.com even reaches 16.94 percent visibility at 8 pm. In comparison to sunday, we also see forbes.com, people.com and nytimes.com in the top 10 for Golden Globes related keywords on Monday. Not making the top 10 are these sunday candidates: variety.com, theguardian.com and avclub.com. Impressively dailymail.co.uk stays on top, but latimes.com joins them there, instead of hollywoodreporter.com. Though the field catches up to them over the afternoon and straightens out. 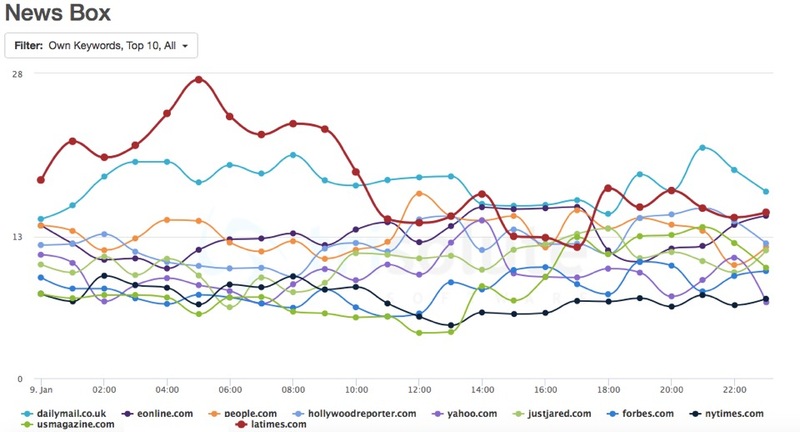 The highest overall visibility on that day is reached by latimes.com with 27.43 percent at 5 am. People.com has the biggest gain in their visibility score. For the AMP Carousels we want to look at the data for January 8th in more detail. In contrary to desktop News Boxes on that day we have deadline.com, people.com, ew.com and etonline.com making the top 10. People.com and deadline.com even make the top 5 publishers in the AMP Carousels for all three days – different than in the desktop News Boxes. Before noon the field is very tight-knit with only variety.com and deadline.com a tad above the competition. In the afternoon the field gets broader, while our top 2 stay on top, dailymail.co.uk, etonline.com and theguardian.com lose some of their visibility. On the other hand people.com, hollywoodreporter.com, yahoo.com, ew.com, eonline.com slowly climb up over the evening and into the night. 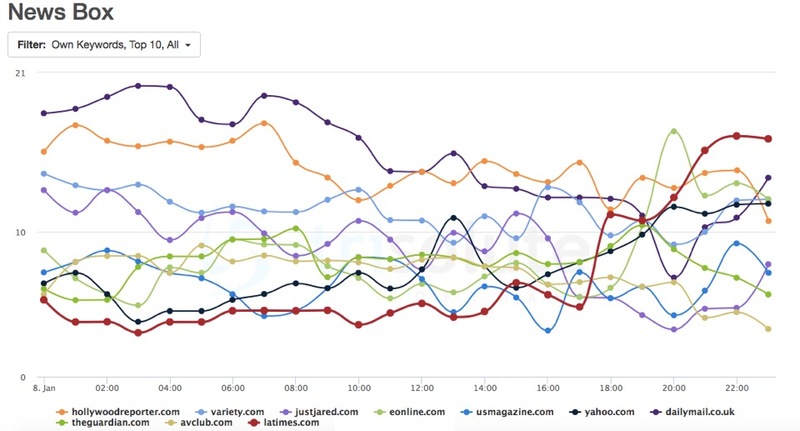 And while varitey.com gains visibility, deadline.com’s run finishes and people.com dominates the night with nearly 46 percent visibility at their best. And for the finishing touches: The dailymail.co.uk makes the overall top 5 in the Google News Boxes for desktop for all three analyzed days and dominates most of the 8th of January. The strong performance of the dailymail.co.uk is a surprise. The publisher with the biggest leap in the desktop News Boxes is latimes.com – they dominate the 9th of January, especially in the early morning hours. For AMP Carousels the field only clearly differentiates beginning with the evening of the 8th – from then onwards people.com takes the cake without a doubt.